Oh how I would love another one of these little beauties for my Sewalot Collection. Over the years I have often seen them come up for sale but I keep getting outbid so I keep my eyes peeled and hope. I recently bid $900 and missed a beauty. Only in production for four years in the 19th Century, in good condition they are as rare as hen's teeth. The Tabitha and its many cousins was a design triumph, a cheap sewing machine for the masses made in the simplest possible way. All luxury was stripped away to leave just a basic machine that would make a chain stitch. 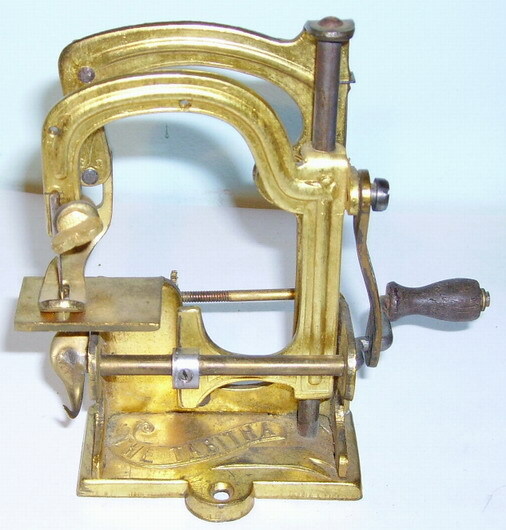 Thomas H Martin's design of 1884 envisaged a single sheet of brass, tin or other cheap material shaped into the desired form by a single stamp of a pressing machine. In one manufacturing process the base, sides, cloth plate and presser arm of the machine could be made. Then a few extra spindles, bits & bobs and hey presto a sewing machine that works. No Tabitha sewing machine looks better than the plated and skirted model. Stunning. This made the machine incredible cheap and simple to manufacture. All you had to do was put the pieces together and you had a sewing machine for the masses cheap and cheerful, certainly as cheap as any toy machine...but sold as the real thing! Tabitha sewing machine box made by one of the largest Tabitha manufacturers. However. Isn’t there always a however! The simplicity of the machine was fatally flawed as soft metal like brass had no lasting performance. Limited production and flaws like that makes the Tabitha a rare machine today as most of them have bit the dust years ago. The feed mechanism dragged the work through by the needle that moved epileptically forward, up, down and back. A similar but vastly improved method still used on some industrial machines, like the Brother B791, today. Notice the slot in the foot to allow the needle to feed the work. Another silly mistake was the handle. Originally just bent wire. Later models had a little wooden knob but it was no good as it went below the machine when turned so your hand hit the table! Notice the cheap wire handle, later replaced with an improved wooden one. If you have a wire hanlde Tabitha you probably have an early model. This meant that the machine had to be mounted onto a raised block then clamped to a table or screwed to the edge of a table. What a kerfuffle! 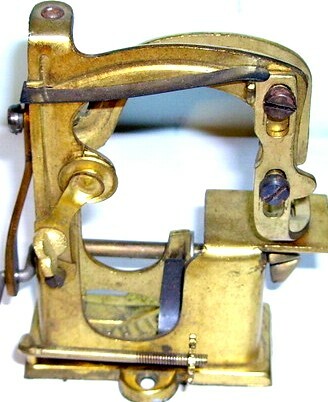 You can see that the La Queen sewing machine with its clever clamp gets around the handle and mounting problem in one go. It sounds like I hate this machine but I actually love them, flaws-and-all it is fascinating. You can almost see the designers mind working as they made the ingenious little contraption. And when set up well the little beauty sews a perfect chain-stitch even though the instructions say to use soap to help the fabric pull through! So was this just another money-making Victorian scandal or a real machine with potential? The machine is strikingly similar to the La Queen sewing machine patented by our old friend S A Rosenthal, patentee of the Moldacot Sewing Machine. S A Rosenthal, possibly Sally? Rosenthal has some credit with being one of the original designers of the Tabitha. Once the designs were sold almost any engineering firm could produce the Tabitha and many turn up with different names and one in particular was a real beauty. This mini Tabitha sewing machine is just 3 inches tall, even smaller than the normal Tabitha and exceptionally rare. I have only seen one in 50 years! This amazing sewing machine novelty came from Vienna in 1890, a time of unsurpassed elegance at the end of the Victorian era. Dance cards or 'mini diaries' came along shortly after the great balls started. The dance card novelty, added to the dance card, made its first appearance in the balls around 1820 when the more formal balls came to an end and the era of the spectacular 'show balls', arrived. 'Dance cards' ('carnet de bal' in French) were used by ladies to keep track of the gentleman to whom they had promised dances throughout the evening. They hung from their fabulous ballgowns by small hooks. They were petite and easily portable and were an indispensable. A ‘must have’. In later years the dance cards had novelties added to them, from bottles of perfume to modern marvels. It made the dance cards highly collectible. They were an especially elaborate novelty with a very useful purpose. Afterwards they served as mementos of the occasion. As novelties they could be anything from a simple broach to a tiny telephone, often they were small crystal bottle of perfume from a renowned supplier like Channel. This tiny dance card was the height of fashion for nearly three hundred years. The novelty add-on sewing machine was incorporated in the Victorian period. Extremely rare today they are small but still sew! The sewing machine above is barely 3” x 1 ½”. It is identical in almost every way to the slightly larger Tabitha and possibly made by AUG. KLEIN k.u.k Hoflieferant, Graben 20, WIEN, Austria. They are extremely rare. 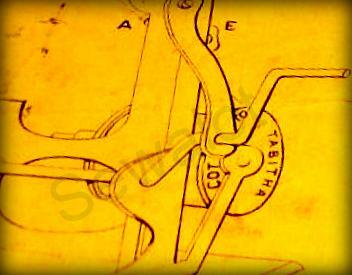 Now back to our story of the Tabitha Sewing Machine. 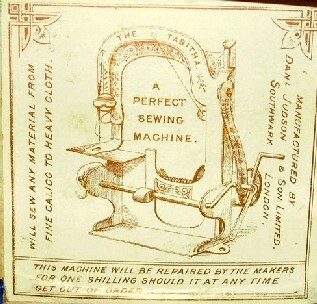 Daniel Judson & Sons claimed to be the main manufacturers of the tiny Tabitha or Popular Sewing Machine in Britain. Prior to the trades Description Act any person could claim manufacture. In this case it is simple to presume that even if he was not the actual manufacturer he knew who was. Judson may have bought the manufacturing rights from Martin and tried to make money from his invention or he may have actually manufactured the little brass gems. Several different models exist some with solid bases some with screwed on ones, some just held on with tabs. The best by far was the pleated skirt base that looked perfect. Further improvements to the needlebar assembly were made by J J Robinson and E Hanff of Middlesex. This allowed for needlebar timing to be improved and altered for each individual machine. I have never seen one of these later models. I wonder if they were trying to revitalise sales as a presser foot lever and different cotton reel position were also on their designs. What a beauty. You can see why these rare machines fetch good prices when they do come up in auction. Photo kindly supplied by Karen who was left this stunner by her Great Aunt, lucky girl! Silver plated brass Tabitha Long-Skirt sewing machine . Some models had wooden handles some without, some with patent details stamped on, some ornate and some plain. It shows that there were several manufacturers. Also the machine did not get stamped out of a single sheet of brass as originally intended. The bases on all the machines I have seen are much thinner than the rest of the machine. 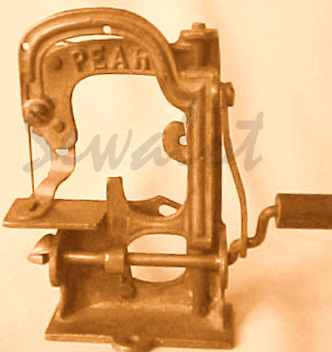 The main sewing machine, hardly five-inches square, was patented by Thomas Herbert Martin of Middlesex, with the first Patent application in England on 29th of Sept 1886. 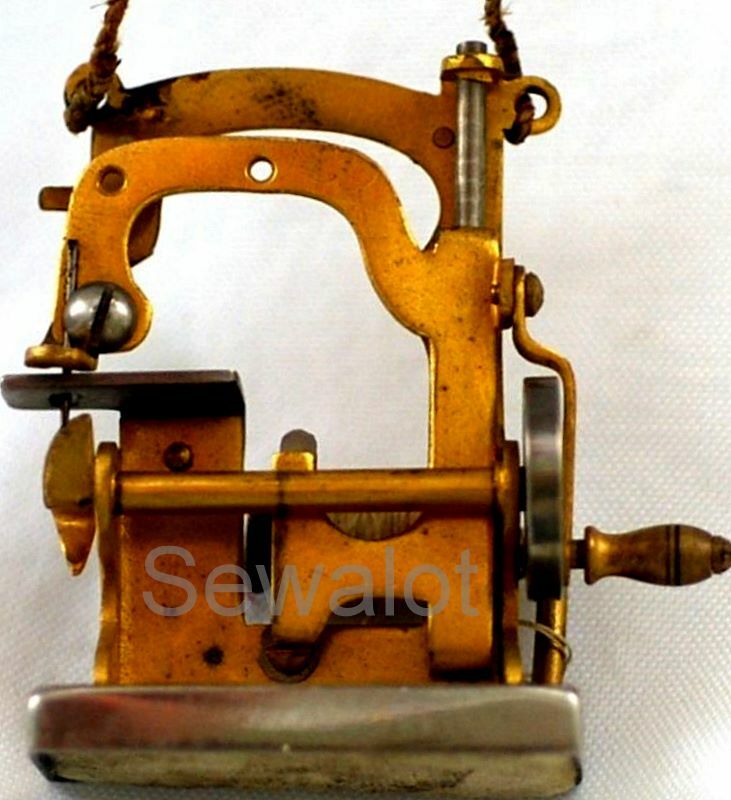 Not far from the same time as that money spinning marvel the amazing Moldacot sewing machine. The potential for this simple, cheap design was quickly realised and patent protection was applied for in many countries including the USA. Some of the machines boxes were then marked Daniel Judson & Son London & New York. 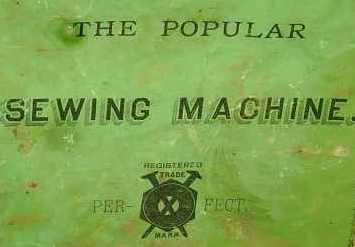 Because of the ease of manufacture, due to the machines simplicity, it was in production quickly and was being advertised and sold in the UK as early as December 1886. Daniel Judson & Son Ltd 77 Southwark Street, London South East. Agents for Tabitha sewing machines. In the United States of America the Tabitha was made by the Manhattan Brass Co of New York. It was patented there in 1887 and 1888. Guess what material they used? If you don't guess brass stand in the corner for an hour. In Britain, Daniel Judson and his son sold some of their machines by early mail order from numerous adverts in the national and regional papers. They boasted that no matter where you lived postage was less than sixpence with fast delivery. 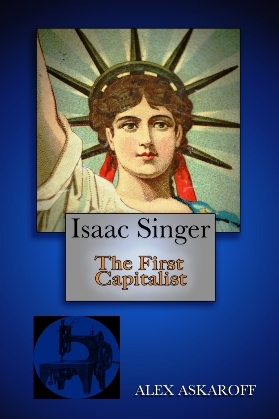 Their trademark was a crossed screw and nail with Perfect written across a steel nut. Well yes it did. But for how long. 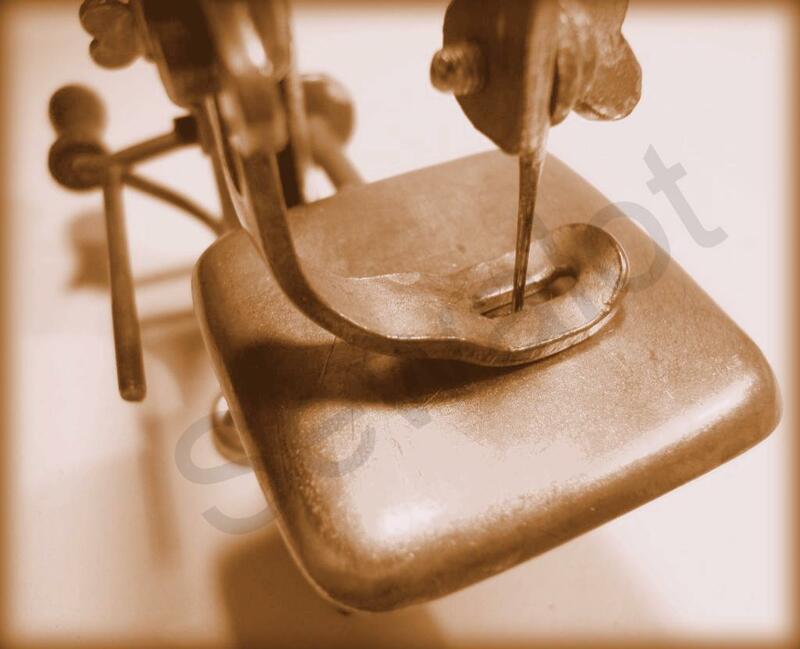 Sewing machine makers of the time were already using super hard high carbon steel for their sewing machine parts. Brass is so soft it would not last long when used regularly. Its a bit like the plastic they are using in sewing machines today. Very limited use. The pre-tested machine came in a cardboard box with a table-clamp and set of instructions for threading and needle changing. I can understand why it had sample sewing with the machine. Can you just imagine the scene. The 'ever-generous' husband has bought the cheapest 'real sewing machine' on the market instead of a proper Singer or Frister & Rossmann. He is now arguing with his frustrated wife, "Of course it works, look there is the sewing to prove it. It's you...not the machine." The poor girl has no hope...or maybe they have both learnt a valuable lesson, 'buy cheap buy twice'. On pay-day he is going down his local hardware shop to buy the best sewing machine in the shop. It may cost a months wages but he has learnt that keeping his wife happy is very important. Now, back to the machine, simple and basic as it was still was promoted as an adult sewing machine! Strange but true. The fact that you could hardly get a piece of cloth through the tiny machine seemed to matter not. They even supplied special small reels of thread at two-pence and needles at one penny, post-free. Maybe that was the machines weak point. Selling it as a proper adult machine meant it would be used on material that it just would not be able to cope with. That would lead to returns and complaints. If it was marketed and sold as a toy it may have been a best-seller! Another serious design flaw was that the hook was made of soft brass. Once the needle had scraped it a few times the thread would snag and the machine would become useless. All the minor sewing machine design flaws could have been easily sorted and a perfect little toy sewing machine would have resulted. But that was not what happened. 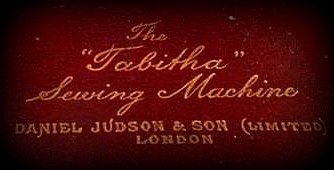 Within four years the company had started and finished and the result is that the Tabitha has become one of the rarest and most collectible of early Victorian sewing machines. Rear view of the Tabitha sewing machine with improved thread tensioner, basic but sweet. Another early boast from Daniel Judson was that he would repair any of his Tabitha machines for one shilling whatever the problem. I can just see him in his in his workshop late at night peering over his half-rimmed glasses, oil lamps flickering, a pair of pliers in his hands and a box of parts by his side. The small family firm worked out of their premises at 77 Southwark Street in South-East London. Early models did not have a wooden hand-wheel simply a bent wire arm and a protruding piece of sprung steel by the needleplate just right to catch your fingers. 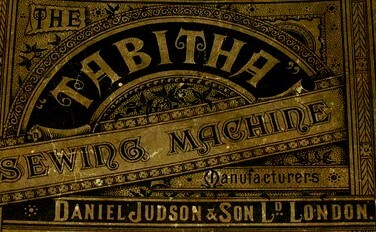 Tabitha sewing machine woodcut 1887 London, notice the price. Cheap as chips. What I love about the advert was that they stated that this little machine would sew anything from the lightest calico to the heaviest of cloth. Pull the other leg and don’t forget to pull the fabric through while you are sewing. Tabitha sewing machines survive in a variety of cases. This one is now in my Sewalot Collection. 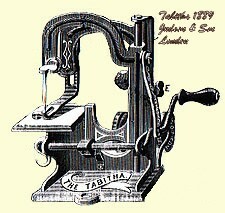 From 1886 until its early, but well-deserved demise around 1889-90, the Tabitha Sewing Machine was tried-tested-and found wanting. Now that is not to say collectors won’t sell their kids for them. There is no doubting how sweet these little gems are and if you have one going cheap do email me I’ll put the cash in the post. I love them. Yana Askaroff with Tabitha sewing machine... with skirt (the machine that is)... now proudly in my Sewalot Collection. At last I have found a beautiful Tabitha for my collection (actually two, one with a skirt). I am amazed at how well it sews on more solid fabric. The picture is above. I have to eat dirt now and say sorry for criticising the stitch so much. When you spend hours getting everything just perfect it will stitch some fabrics...just. How long it will sew for with it's soft metals heaven only knows but I am very happy to have found it. A Tabitha sewing machine sold as a Pearl sewing machine. 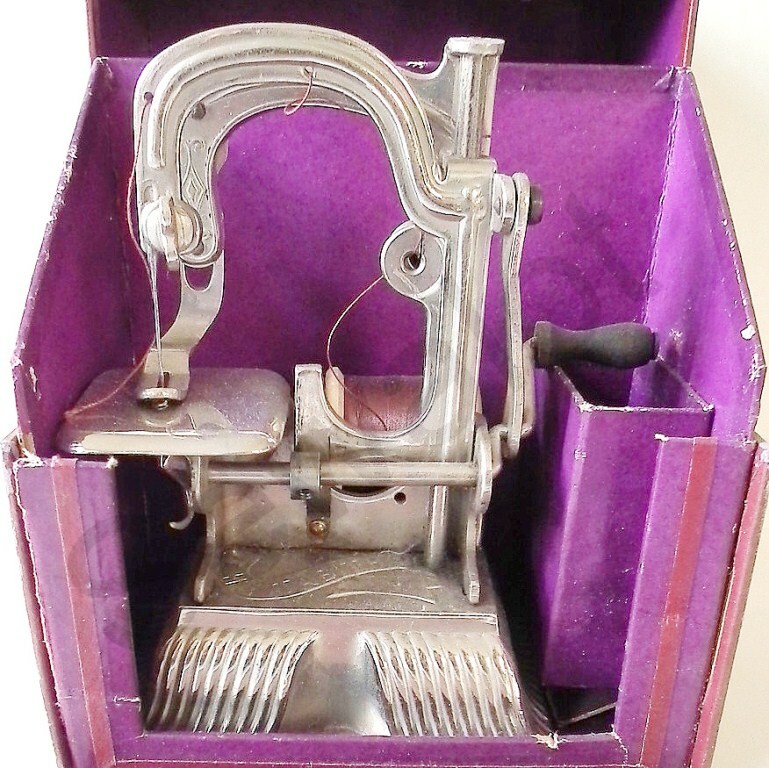 This machine is from an unknown producer who must have bought the rights and tools for the Tabitha sewing machine, including the press cutting stamps. Tabitha was sold under many names, many clearly stamped on the top arm like, The Pearl sewing machine above. 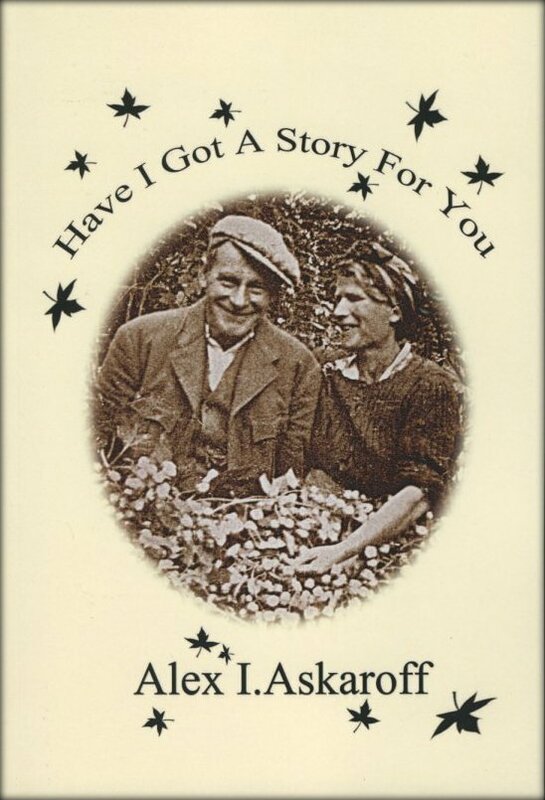 All Alex's books are now available instantly on Amazon, Kindle and iPad and in paperback worldwide.